Having progressed to the finals after winning 4-1 on penalties in the semi-finals against Anglo-Chinese Junior College (ACJC) last week, our soccer boys were determined to carry on their winning streak by beating Victoria Junior College (VJC) to clinch the National A Division Boys’ Football Championship title, which they last won in 2007. A great number of supporters turned up to root for our soccer boys, as they prepared to fight for glory. Technical problems before the match prompted supporters to sing the Institutional Anthem without background music, which seemed to herald a tough match ahead, against a strong rival who has already obtained three championships in the last 10 years. And it was, indeed. Our soccer boys started off shakily and did not seem very focused on their attack, often giving up possession in the first five minutes due to careless tackles and fouls. On the other hand, the opposition was more composed, pressuring our soccer boys with practiced one-two passing. 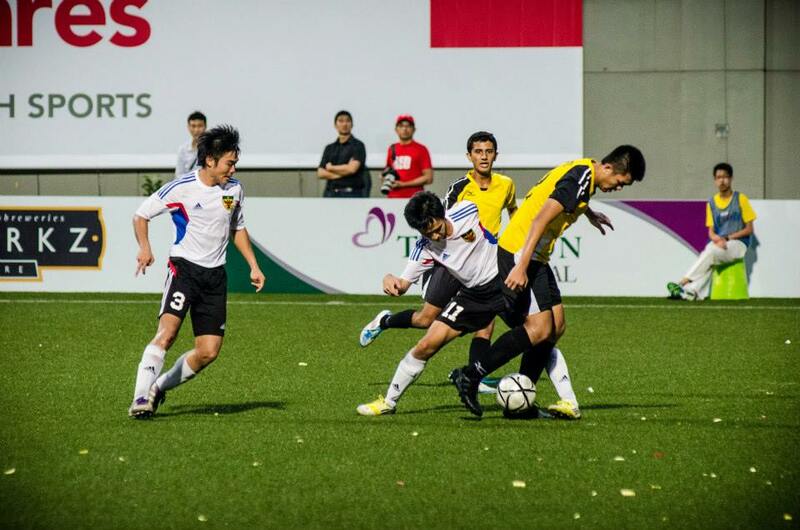 Raffles made few attempts to steal the ball and move forward, clearly overwhelmed by the opposing team as they launched attack after attack. Slightly before six minutes into the game, Deferdauz (VJC #7) put his team ahead by maneuvering the ball past two of our defenders on the left wing of the VJC side before calmly slotting the ball past RI goalkeeper Samuel Soo (#1), nestling it in the bottom left corner. VJC continued attacking, thoroughly testing Raffles’ defence that crumbled far-too-easily as our soccer boys applied little pressure, giving VJC much room to send the ball forward. Deferdauz (#7) continued to edge out our defenders with his agility and superb control of the ball. After cleanly receiving a through pass from midfield, he skillfully turned and launched a powerful shot from outside the penalty box without any challenge from the RI defenders. 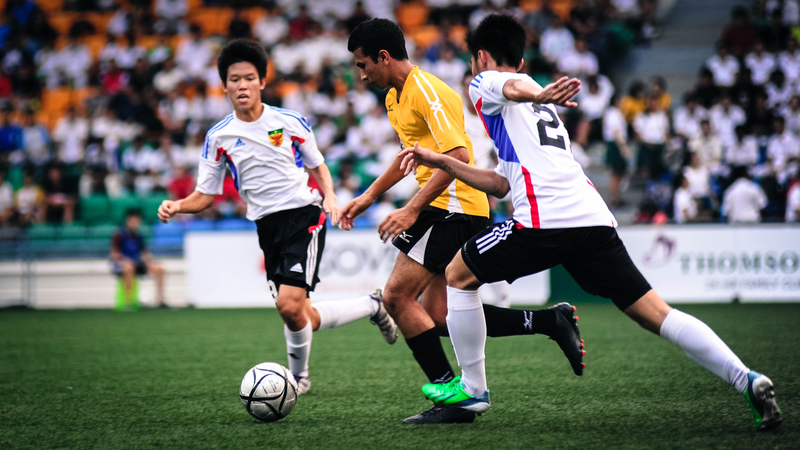 The ball flew past the outstretched arms of goalkeeper Samuel Soo (#1) and landed into the top left corner of the net, leading Raffles to concede their second goal merely six minutes after the first. 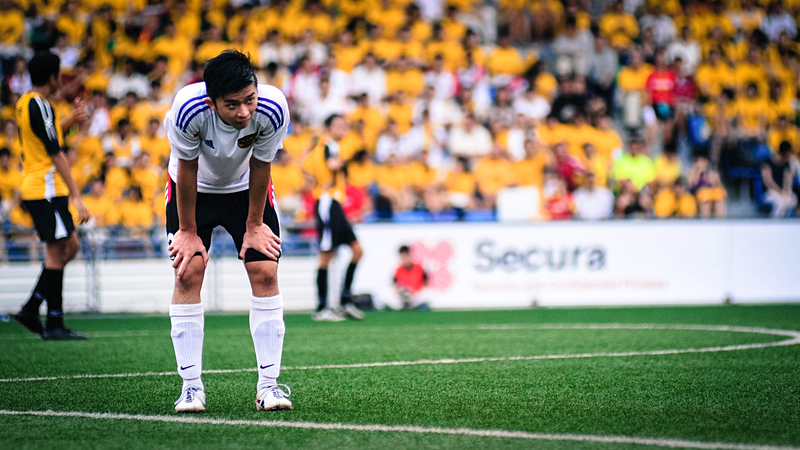 The early goals mounted greater pressure on our soccer boys, who were playing with visibly low morale, if not with fear. They were hardly able to establish a proper attacking setup, with subpar control of the ball. VJC used numerous short and concise passes towards the goal to maintain possession, compared to the unpredictable long passing adopted by our soccer boys. Two minutes before the end of the first half, Dominic Ho (VJC #19) extended the lead for his team by one more goal as he swiftly sneaked behind defenders Damian (RI #13) and Abdul Hannan (RI #6), and aimed a shot towards the goal, which saw the ball glide into the bottom right corner of the net, denying any effort from Samuel Soo (#1) to save the ball. This marked the end of a nightmarish first half, one that our soccer boys will find hard to forget. 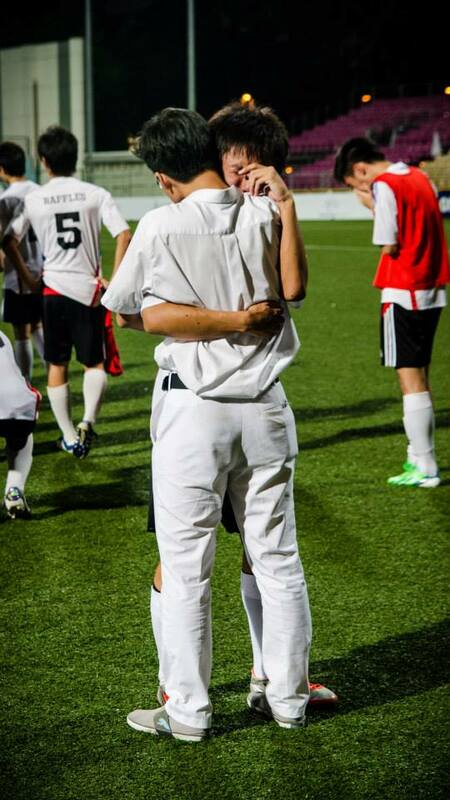 “The boys were playing with fear,” said RI Coach Philippe Aw. Nonetheless, a resounding 3-0 lead by VJC in the first half did not extinguish the fire in our soccer boys nor affect the RI supporters in the second half. The RI contingent continued to cheer fiercely, their undying optimism giving our soccer boys a tremendous morale boost in the uphill battle of making a comeback. The 15-minute halftime break enabled our soccer boys to recover their composure as Coach Philippe requested the boys to simply “forget the scoreline, go out there, enjoy yourself, play the football that you know how to play and reward the huge turnout of fans”. The start of the second half saw our soccer boys play with even more determination and fighting zeal. 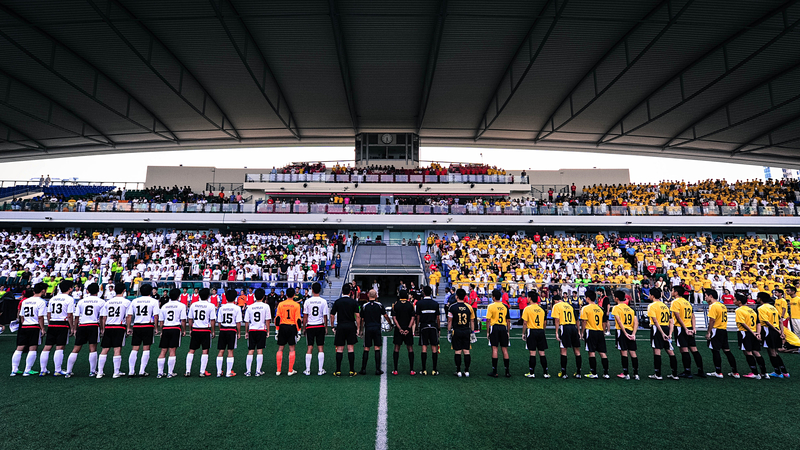 Despite the seemingly impossible feat of coming back, Raffles showed their indomitable will to break even by playing more fiercely, and finally challenging the VJC defence, who appeared to be intimidated, even surprised by a sudden surge of energy in our soccer boys. The most compelling evidence was the drastic increase in ball possession that Raffles earned by switching from the inefficient long balls in the first half to more precise short passes. This time, Raffles adopted a more offensive stance while VJC chose to go defensive, so as to defend their strong lead. It became increasingly obvious that the VJC team was losing hold on the game as Raffles progressed quickly down the flanks, preventing the opposition from seizing the ball. The mounting pressure from our soccer boys finally took its toll on the VJC team as they started to make mistakes in their defending, causing them to let in two goals within two minutes of madness, destroying their 3-0 lead to make the scoreline 3-2. Flustered, VJC players began to lose focus, fouling our soccer boys with weakly conceived tackles, in which Muhammad Firdaus bin Asri (VJC #3) obtained a yellow card after a hard foul. The resultant free kick by Captain Jesse Chang (RI #8) indirectly led to the first goal, when defender Koh Jin Kai (VJC #12) attempted to head the ball away, but landed the ball into his own goal just as the clock ticked past the 67th minute. Merely a minute later, VJC conceded their second goal from another free kick by Jesse (RI #8) some ten meters outside the penalty box on the left flank. This time, goalkeeper Horatio Ho (VJC #13) fumbled and was unable to get his hands on the ball, allowing it to fall nicely inside the goal without any intervention, prompting an eruption of cheers from the RI contingent. As the match approached its final moments, Raffles continued to pound VJC shot after shot, and they were finding it more difficult to keep their previously solid defence strong. Raffles played on furiously, with renewed hopes of a tie in the scoreline, as the RI supporters roared in unity “One more goal! One more goal!” Despite being pressed, VJC had rare opportunities to threaten our side. In one instance, keeper Samuel Soo (RI #1) made a brilliant double save, denying a strike by Dominic Ho (VJC #19) and a follow-up shot by Deferdauz (VJC #7) just seconds later. Our soccer boys might have lost in their final against VJC, but their sheer grit and resilience through the entire season is undeniable. 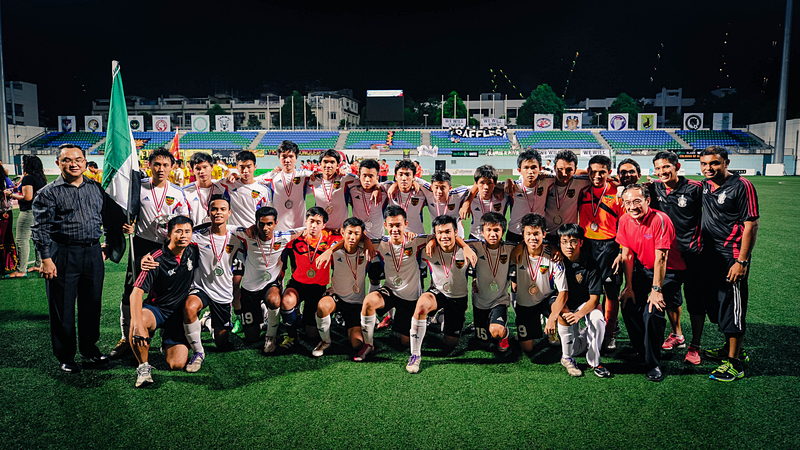 Raffles Press wishes our soccer boys all the best in doing the school proud in their future endeavors. Although our soccer boys lost the game, they are not beaten.